Today's drawing is a little rough. There is so much house work and garden work to be caught up on. 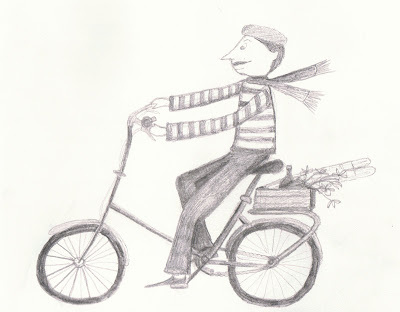 Monsieur Vélo is riding home to his 'cherie' with flowers, wine and baguettes. Tres bien! Could you please ask Monsieur Vélo to pass by my house to, to drop off two baguette, an extra smelly french cheese (any will do), and a nice bottle of bordeaux? Best wishes, and I'm happy your babes are feeling better! I wish my rough drawings looked 1/2 as good as that ! Thank you ladies for your comments about mon petit Monsieur Vélo. He is pretty cute hey! I'm really loving my little French theme right now. I think this is my favourite of your drawings so far, they are all so cute though.. I wish I could draw like that. I also really like the nun. You need to write a little french children's book now to match with the pictures :) I know this post is so old sorry.. I forgot you'd moved your blog here so I had some catching up to do!